Innovation is a crucial element of modern societies, but who becomes an inventor? This column shows that parental income affects the probability of someone becoming an inventor, but that this impact is greatly diminished once parents’ socioeconomic status, parents’ education, and the individual's IQ are controlled for. Overall, the results suggest a prominent role for parental education and for IQ in explaining an individual’s probability of inventing. Does education lead to more innovation? Who becomes an inventor? Does innovation attract the most talented individuals, or the individuals with privileged socio-economic background? The following figures motivated our analysis. Figure 1 depicts the relationship between an individual's probability of becoming an inventor and his father's income, respectively, using recent US data (Figure 1A, drawn from Bell et al. 2017), US historical data (Figure 1B, drawn from Akcigit et al. 2017), and recent Finnish data (Figure 1C). 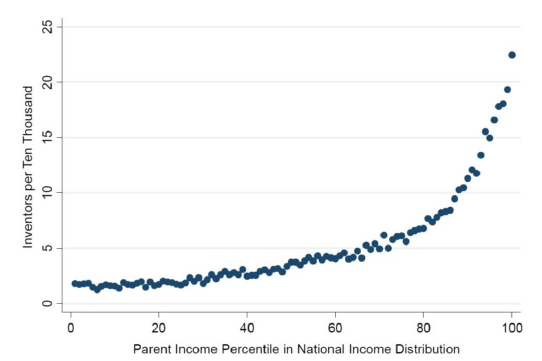 From these figures, we see that in all three cases, the individual's probability of becoming an inventor increases with the father's income, and that the effect is highly non-linear, being particularly steep at the highest levels of father's income. The probability of innovating for an individual whose father is at the very top of the income distribution is about ten times larger than the corresponding probability for an individual with a father at the bottom end of the income distribution. The similarity between Finland and the US is all the more remarkable given that, unlike the US, Finland displays low income inequality and high social mobility in international comparisons, and offers free education up to and including university, whereas the opposite is true for the US. What lies behind the steep relationship in between father’s income and the probability of becoming an inventor in Finland? 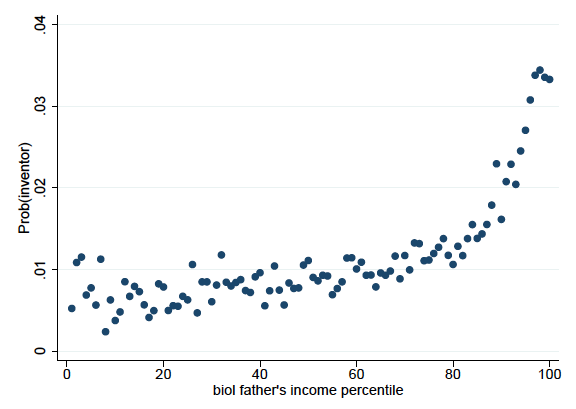 Notes: The figure displays the probability to invent as a function of father’s / parents’ income percentile. Figure 1A comes from Bell et al. (2017) and Figure 1B from Akcigit et al. (2017). In Figure 1C, father’s income is measured in 1975 for individuals born 1961–1975, and in 1985 for individuals born in 1976-1985. We calculate the percentile ranks using residuals from a regression of the natural log of deflated income of fathers and mothers on year-of-birth dummies. Figure 2 plots the probability of inventing against visuo-spatial IQ percentiles. We see that the probability of inventing has an increasing and convex association with IQ, and that those individuals at the extreme right tail of the IQ distribution are five to six times more likely to invent than individuals in the middle of the IQ distribution. Notes: The figure displays the probability to invent conditional on the visuo-spatial IQ percentile of the individual. IQ percentiles are calculated on the basis of the normalised IQ score, where normalisation was done separately for each conscription cohort to avoid the Flynn effect. IQ data from the Finnish Defence Force (given that conscription only affects males in Finland, we concentrate on the male work force in this paper). 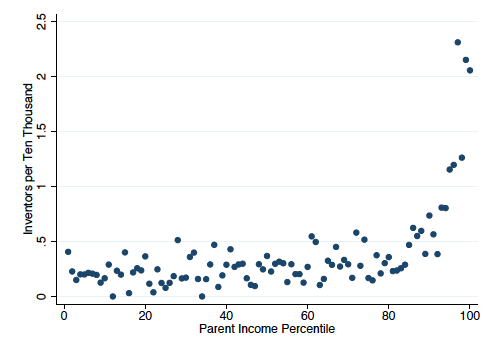 Our first main finding is that parental income matters for the probability of becoming an inventor, but the estimated impact of parental income is greatly diminished once parents’ socioeconomic status, parental education, and the individual's IQ are controlled for. Figure 3 summarises our findings. First, the overall relationship between father’s income and the probability of becoming an inventor is depicted by the upper curve (this curve mirrors the non-parametric Figure 1). Does this curve reflect a direct effect of parental income on the individual’s probability of inventing? The answer is no. Notes: The figure displays the estimated probability to invent conditional on father’s income quintile. The probability to invent conditional on the father being in the lowest quintile (base group in the regression) is the sample mean for individuals with a father in that income quintile. Indeed, as we control for parents’ socioeconomic status (e.g. both father or mother are senior white-collar workers), then for parental education, and then for the individual’s IQ, we see that the curve between parental income and the probability of becoming an inventor moves down and becomes increasingly flatter. This in turn suggests that the apparent relationship between parental income and the probability of inventing hides more complex channels which have not been considered or analysed to date. A first channel is that high-income parents typically enjoy a higher socioeconomic status. A second channel is that higher-income parents tend to be more educated, and more educated parents in turn train their kids more effectively (e.g. homeschool) with the sorts of skills inventor’s need. A third potential channel is that higher-income parents produce higher IQ children, and that higher IQ children are more likely to innovate. Our second main finding is that visuospatial IQ (the IQ measure which arguably best reflects innate ability), has a positive effect on the probability of inventing which is almost five times as large as that of having a high-income father. To address the potential endogeneity of IQ, we focus our analysis on potential inventors with a brother close in age, which allows us to control for family-specific, time-invariant characteristics. The effect of IQ on the probability of inventing is robust to adding these controls. It is interesting to compare the impact of parental income and IQ on the probability of becoming an inventor with their impact on the probability of becoming a lawyer or a medical doctor. First, we find that if all individuals belonged to the highest IQ decile, the probability of inventing would increase by an additional 183%, whereas the probability of becoming a lawyer would remain unchanged, and the probability of becoming a medical doctor would increase by (only) 86%. On the other hand, if all individuals had a father in the top income decile, the probability of becoming an inventor would increase by about 30%, whereas the probabilities of becoming a lawyer and a medical doctor would increase by much more (78% and 72%, respectively). Overall, IQ is more important for becoming an inventor than it is for becoming a lawyer or a medical doctor, while parental income and education are less important. Does this mean that family background does not matter for becoming an inventor? Here again our answer is no. We provide evidence on the importance of family structure by comparing individuals with a missing biological parent or individuals with a stepparent. We find that parental divorce decreases the probability of becoming an inventor and that the income of biological parents matters only when the child lives with them. Next we explore the complementarity between IQ and family background. We find a positive and significant interaction between an individual’s IQ and his father’s income. This in turn points to a potential source of misallocation – namely, a positive fraction of individuals with very high IQ will underperform as potential innovators due to inadequate parental resources. To better illustrate this point, consider two individuals A and B whose fathers belong to the lowest income quintile. 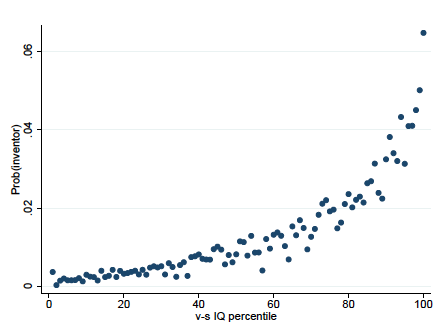 Individual A has an average IQ, whereas individual B has a top IQ in the 96-100 IQ percentile range. Reallocating individual A to a father with wage income in the 96-100 percentile range will increase A’s probability of inventing, but reallocating individual B to the same father would increase B’s probability of inventing more than three times more. This suggests that high IQ individuals are particularly affected by misallocation – inadequate parental resources are disproportionately harmful for the highly talented, thereby eroding the innovative potential of the economy. One important way in which parental income and IQ may interact is through the individual’s own education. Using our estimation sample, we find that having a Master’s or a PhD in Science has a much bigger effect on the probability of inventing than any other variable. Also, once we control for the individual’s own education, the effects of all other variables except IQ are greatly reduced. But what determines an individual’s own education? 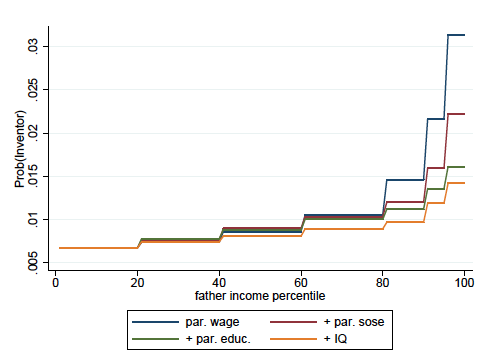 Using an R-squared decomposition, we find that IQ accounts for 40% of the explained variation in individuals’ own education, followed by parental education (27%), with parental income per se contributing less than 5%. Thus, overall, our results suggest a prominent role for parental education and for IQ when explaining an individual’s probability of inventing. Our analysis has interesting policy implications. First, it suggests that by massively investing in education up to the PhD level – especially in science, technology, engineering, and mathematics – a country should significantly increase its aggregate innovation potential while making innovation more inclusive. Second, while IQ is of major importance in determining the level of education, family background and parental education also play an important role, even in an equitable welfare state like Finland where education is free up to and including university education. Aghion, P, U Akcigit, A Hyytinen and O Toivanen (2017), “The social origins of inventors”, CEPR, Discussion Paper No. 12496. Akcigit, U, J Grigsby and T Nicholas (2017), "The rise of American ingenuity: Innovation and inventors of the Golden Age", CEPR Discussion Paper No. 11755. Bell, A, R Chetty, X Jaravel, N Petkova and J Van Reenen (2017), "Who becomes an inventor in America? The importance of exposure to innovation”, NBER Working Paper No. 24062. In particular, once we control for the individual’s own education, the relationship between father income and the probability of inventing becomes essentially flat.